The first rule encompasses being kind to others, helping others, respecting the rights of others (not interrupting other children at their work, using a quiet voice indoors, etc. ), and this rule is also expanded to include plants and animals. The second rule includes the children in the care of their environment. By taking care of the materials that are so vital to their development (dusting, polishing, putting away properly, handling with care), the children grow in self-esteem, and, by controlling their environment, are able to control themselves. The Directress will keep the disruptive child with her/him as she/he goes about assisting other children. This allows the child to observe the “normalized” behavior and perhaps find activities to the child’s liking. Persistent disruption may be dealt with by temporary removal from the group (time-out). The child may return to the group when willing to abide by the stated ground rules. If necessary, the staff will seek parental help and guidance in understanding the child. If unable to resolve the problem with the assistance of parents, the staff will recommend professional help to parents. Under no circumstances shall any child be subjected to corporal punishment, verbal abuse, or be deprived of regularly scheduled meals or snacks. Children learn to respect others after they have the experience of being respected. This is one of the basic principles of the Montessori philosophy and effective discipline. It is important for children to establish a sense of autonomy and self-confidence, to believe that they are worthy of respect, and to know how to live among people in a disciplined way. Why Should The Child Attend School Before Age Six? The first step in a Montessori education addresses itself to early childhood education and lays a foundation for how a child will learn throughout his/her life. 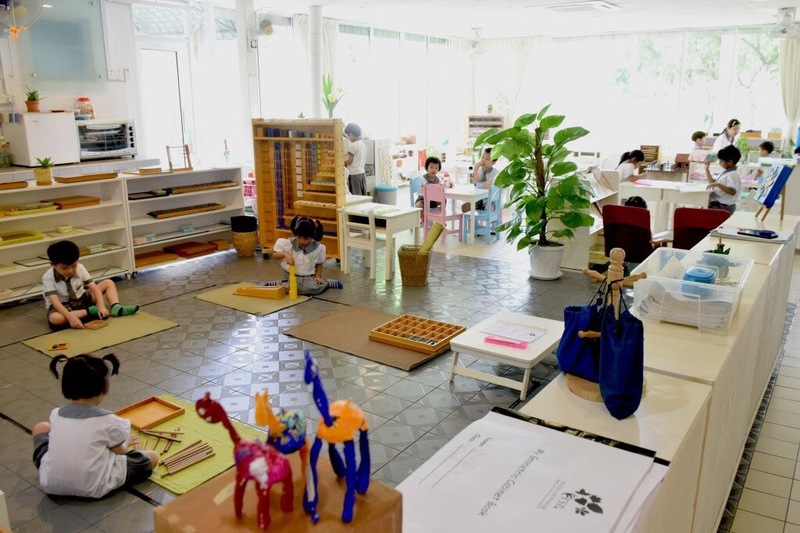 A Montessori preschool is neither a baby-sitting service nor a regimented place where children are forced to achieve. We offer the child the opportunity to develop individually within a carefully defined structure. School is a natural and enjoyable experience. Furthermore, the Montessori philosophy regards the years from birth to six as crucial in a child’s development. It is during this time that children have sensitive periods. This differs from a critical period. A sensitive period is one in which a child has a natural desire to acquire a particular trait or skill. He/she will occupy himself/herself with particular activities with an interest and concentration he/she will never again display for that particular activity. Unlike a critical period in which he/she must acquire the skill during that time or she will never acquire it, a sensitive period is one in which a child desires to accomplish a particular task. He/she could learn how to master that same task at a later time, but not with the same fervor, zeal and ease of the sensitive period. Some examples of sensitive periods: Two-and-one-half and three-year-old children are usually in a sensitive period for order. If certain objects are not in their usual places, a young child will rearrange them until they are. It is also speculated that humor originates from this sensitivity. For example, if an adult put a vase on his head and called it a hat, a young child might be confused. She has recently learned in the order of our universe that vases are for flowers and hats are for heads. However, a four or five-year-old might find it amusing because the adult has deviated from the order the child knows well. Four and five-year-old are in a sensitive period for writing. Parents also have reported that at a particular time their child will go through reams of paper printing numbers and letters. Their child really wants to perfect that skill. The length of this period varies and it is a transitory one. Once it is over, the child will still want to print numbers and letters, but not with the same fervor of the original period. Teachers have also observed children who were in a sensitive period for learning the sounds of letters. Each day some children would come to school and want to work on the letter sounds to the exclusion of other activities. There are various sensitive periods. A parent or teacher cannot create a sensitive period in a child; however, the adult can follow and help the child to develop his/her interests. The Montessori school aids the child by providing opportunities for his/her to accomplish the tasks that are important to his/her at a given time. A traditional school, with time blocks for subjects and a curriculum into which each child must fit is not always able to help a child develop his/her interests and sensitivities. Are you preparing your child to cut using scissors step by step? When your child struggling to cut, you started to hold his hand and cut together? When you follow the development sequence of scissors cutting skills, your kids will be much more successful cutting with scissors. To start to use scissors and start to cut like a pro, what are the skills needed? – To have well developed fine motor skills. – Hand-eyes co-ordination skills while moving the scissors following the line. – Bilateral co-ordination, where by involving moving both sides of the body at the same time, while each hand is performing different task. This is where one hand doing the cutting, the other hand holds the paper and turn it. This is a challenge for young kids! Let’s see what are the sequence to prepare for cutting using scissors? In Practical Life of Montessori Classroom, we have varieties of transferring objects or water from one container to another container with hands, tongs, ladle, tweezers or pipette. These can be prepared in your home environment too. Prepare strip of colour papers, allowing the child using their tripod grasp (thumb and first two fingers) to grip the papers and rip. The ripping by moving the hands in different direction allowing the child to practice their bilateral coordination skill too. As they demonstrate readiness, move to larger piece of paper. Snipping is an activity where the child practice opening and close the scissors one time only which results in successfully cutting something. This is to strengthen the hands muscles and prepare for longer lines cutting. Note: A demonstration is needed to show how to hold the scissors before start this activity. Before the child given to longer line cutting. The child proceeds to fringe cutting so that the child learn to stop where the line end. Start given a strip of paper drawn 2 long straight vertical lines. The child need to cut from one point to another point by open and close the scissors multiple times. It is a tiring work for the child. The child can be given diagonal straight lines as an add-on practice. Next, is cutting the zig-zag line. This is a more challenging where the child requires to slightly turn the paper as they cut. There are varieties of curved lines with different level of challenges for the child. This can be tricky to young children. Observed the child progress on cutting in the previous activities to know whether the child is ready for this challenge, otherwise, it can be demotivating the child if it is too challenge for him. Prepare papers with right angles shape like squares and rectangles. A demonstration may have needed to show how to turn the paper. The child may try to turn their arm instead of paper and cut in an awkward way. Note: Pasting using glue will be another activity that need to be introduced. Do not attempt to do both at the same time at the beginning. How can children learn in a mixed-aged classroom? Would it be rather difficult for a teacher to take care of my child’s learning progress in the classroom? I couldn’t imagine how can my child learn better in a classroom with mix ages! As a new Montessori practitioner, I could still remember all these questions popped from my mind when I was still in my college, studying the philosophy behind Montessori’s pedagogy. 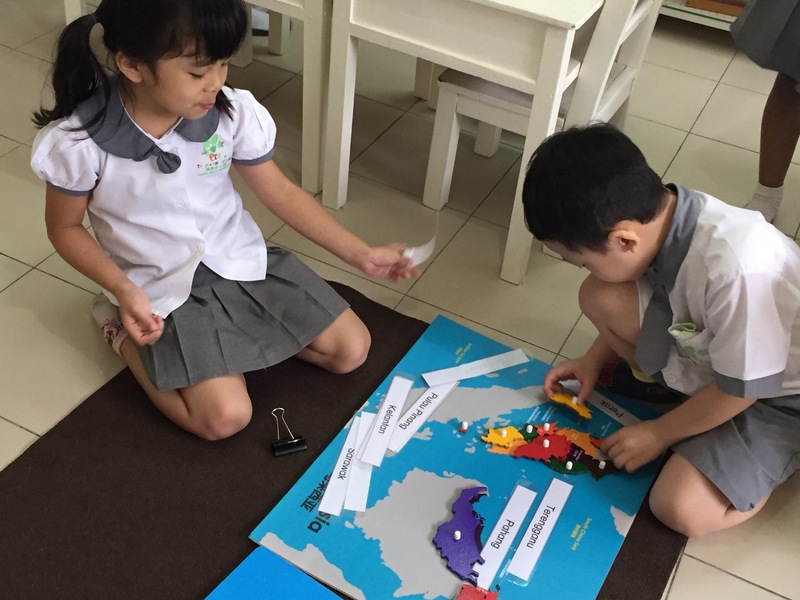 The concept of mix-aged group in a classroom happens to be common around the world. However, how do we know if it is efficient for children’s learning? If we study the philosophy of Montessori’s educational approach, teachers are well-trained being the “eye” of the classroom. They need to have the ability observing every single detail from children’s developmental growth, to a little small pot of plant at the corner of the classroom. Here I am, lucky enough to have the luxury observing how does a Montessori classroom look like. Imagine our working environment as adults, do you work only with people who are the same age as you are? Definitely NOT! This is the main idea, we create a MINI SOCIETY for the children to learn from peers! Physically, you might see the children are growing differently, in fact, they are different in all ways, no matter cognitively, socially, emotionally and development of their language. We always learn from those who share different strengths that we might not acquire yet, this goes the same to the children. Their need to learn can be met by interacting with different age groups! Other than that, in this ‘mini-society’, children learn to respect and response with grace and courtesy. For example, each child will learn to clear his/her workspace after completing their work. What does the child learn? Cleaning the place? NOT ONLY THAT. Children will learn that they need to respect the environment by taking care of the classroom, they will also learn that space is shared among everyone in the classroom. The younger children learn the rules; the older children have a deeper understanding of the reason behind the rules. Therefore, older children will be the guidance, the role model that lead the younger children to learn better in many ways. The older children will develop many positive values while helping the younger children to grow. They will learn to communicate according to the level of younger children’s understanding. I have seen a six-year-old child tried so hard to make a three-year-old child understand the way to paste a strip of paper on her book. She tried to explain verbally at first, but it did not work. Then, she found a way to help her by pasting her own strip in front of her. See that? It’s not only about learning skills, but how the child took the initiative to help and support the younger child.